Abdullahi An-Na’im is Charles Howard Candler Professor of Law at Emory. 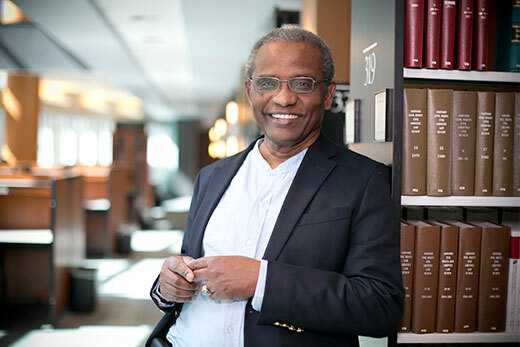 Islam and human rights scholar/activist Abdullahi An-Na'im of Emory Law has launched a new blog, "The Future of Sharia," that takes the controversial concepts from his research and books and opens them up to global public debate. The blog builds on An-Na'im's 2008 book, "Islam and the Secular State," in which An-Na'im tackles complex issues about government secularism and Sharia (Islamic law). "The debate on the question of Islam and the secular state is extremely urgent," says An-Na'im, Charles Howard Candler Professor of Law at Emory. "It's not something that we as academics can sit back and muse about." He says that friends and colleagues in Sudan and Pakistan, eager to have a space to debate issues in a candid way, have already made use of the platform. "My focus is what we need to do to move forward," he says, "rather than keep apologizing and rejecting extremist violence." In addition to the blog calling for debates of Islam, the state, and politics in local languages of Islamic societies, the blog features translations of An-Na'im's book in nine languages, making the information accessible to various Islamic populations throughout the world. Through the blog, An-Na'im aims to take the discussion of human rights into places that his books about the topic would never be allowed. "I'm challenging the very idea of the Islamic state," An-Na'im says. "I'm turning the fundamentalist claim upside-down. "I used to think that secularism was hostile to religion," he says. "Now, I have come to appreciate that it doesn't have to be. In a secular state (like the United States), people have the freedom to practice their religion, and the state stays neutral." An-Na'im campaigns against making Sharia the positive law of the state and provides people with what he calls "good, persuasive scholarship" to support that position. Through the new "Call to Debate" section on the blog, An-Na'im asks for people who agree with him to offer their support through intelligent dialogue – and for people who disagree with his position to help readers understand why. He calls the effort an "educational public advocacy exercise." An-Na'im understands that his position is not without its critics. He welcomes them. "If someone can show me that I'm wrong, I will listen," he says. "I believe that my argument is truly Islamic. I seek out resistance. If I'm not resisted, I'm not relevant." Join the scholarly debate by visiting the Future of Sharia Blog.